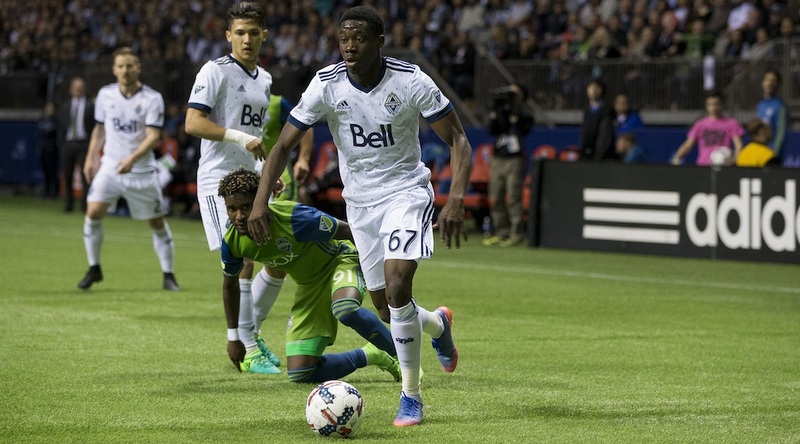 Those were the words of Whitecaps president Bob Lenarduzzi describing teenage midfielder Alphonso Davies, who he also confirmed that some of the world’s biggest clubs are keeping an eye on during an interview with TSN Radio on Tuesday. Though careful in his response to a question about interest from teams overseas, Lenarduzzi did confirm that Manchester United and other clubs are interested in the 16-year-old phenom. What Davies is doing on the pitch is nothing short of remarkable for a kid that won’t turn 17 until November. His abilities were on display once again against the Montreal Impact on Tuesday night, scoring a goal and setting up another to help Vancouver to a 2-1 win in the first leg of the Canadian Championship semi-final. “If he keeps doing what he’s doing, then they’re going to come calling,” Lenarduzzi added. If Davies continues to improve, he’ll move on to bigger and better things. And that would be a good thing for the Canadian international. It can’t happen until his 18th birthday though, so we’ll get to see at least one more season of the Homegrown Player beyond this year. Until then the challenge for the Whitecaps is to develop the teenager without putting too much pressure on him. Head coach Carl Robinson was very measured in his post-match press conference after the win against Montreal. For good reason, he’s trying to protect the youngster. How Davies develops in the coming years will be one of the most interesting things to follow for fans and media alike. The Whitecaps are being smart to shield him from the spotlight, not allowing him to be interviewed by the media, and slotting him into their lineup carefully. Davies is fun to watch for Whitecaps supporters in the short-term, but the real payoff could come down the line, as a member of the Canadian National Team. With Canada looking like a shoe-in to host matches during the 2026 FIFA World Cup, it’s hard for the mind not to wander. Davies will be 25 in 2026. He could be Canada’s best player by then. He could be part of a revitalization of the national program. But Davies still has a lot of work to do to realize his great potential. He needs to put the work in, keep a level head on his shoulders, and continue to grow as a player. Until then? Watch and enjoy.